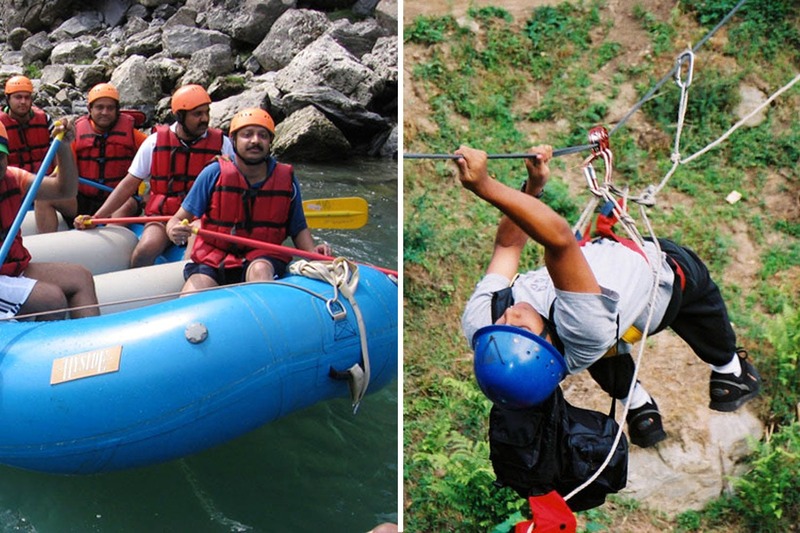 Z Bac Adventures is an exhaustive adventure camp a little away from Mumbai that has everything you need to get your adrenaline soaring. Situated near Kolad in a picturesque, unassuming town called Roha, it will take about three hours (150 km) to reach the Z Bac Adventures campsite from Mumbai. While you can take a cab to the campsite, we strongly recommend getting a big-ish group together, hiring a bus, and turning this into an exciting road trip. Z Bac Adventures is an extensive camp spread over more than 25-acres that intends to run learning modules outside of the conference room and classrooms. Especially encouraging schools and corporates to take their packages, Z Bac Adventures also doesn’t let down if you plan a picnic with family or your friends. While you can book this camp for a party or a re-union, or a proper retreat, what sets its apart is the number of activities it offers. From raft building to kayaking (which happens in a lake inside the campsite), to water rafting in Kolad they have a bunch of water activities. On top of that, they have a plethora of ground stuff to do – some fun talk show games, zip lining, Burma ring loop, archery, rifle shooting, jungle trek, commando clue hunt and what not (click here for the whole list). And because they have a list of things they do, they ensure safety measures are in place thanks to properly certified trainers who have been doing this for more than 10 years. They even have accommodation and a variety of options, in fact. You have the choice of bunking in a luxury tent, a mud house (AC or non-AC), premium dormitories, or valley facing luxury dormitories. And if the weather is favourable, they also set up lake-side camping options. Depending on your requirement – number of people, activities you are interested in, and the kind of accommodation you’d like – they will create a package for you (on per-night basis) that will also include four meals (evening snacks, dinner, breakfast, and lunch) and all the fun around the bonfire. Don’t worry about the upcoming monsoon. In fact we are told by the campsite folks that once the rains get going, the campsite and all the activities become even more interesting. Get control of one of the coming weekends, and book your spots already. Z Bac Adventures won’t disappoint.